Legends of Tomorrow began “Dancing Queen” by beating The Crown at its own game, introducing a Queen Elizabeth who wears her jewels to a punk rock concert and shows off her drawers at the behest of a band called The Smell. Naturally, this incident led to the breakdown of the British monarchy and so the team shuffled over to 1977 London to uncover which magical creature made that happen. 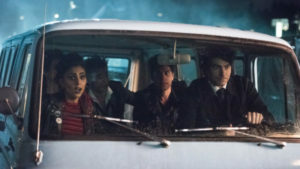 The Waverider’s resident troublemakers – which at this point is essentially everyone but Ray (Brandon Routh) – headed into the punk club to try to infiltrate the band with their punk rock knowhow, leaving Ray behind as a getaway driver. But before too long, Mick (Dominic Purcell) issues with Constantine’s (Matt Ryan) accent and tie led to an all-out pub brawl. So the band landed in Ray’s car, befriending the absolute worst liar and most straight-laced individual on Legends of Tomorrow. Pairing Ray with his polar opposites is always a recipe for success, and “Dancing Queen” had a lot of fun with his code name (“Rage” for all the rages he clearly throws) and hijinx such as kidnapping the Queen’s corgi with a little help from Sara’s (Caity Lotz) fighting skills and Mick’s instructions on how to stand still. By the time he was given his group induction via tattoo, he had figured out that it wasn’t a leprechaun they were dealing with but rather a young woman named Charlie. Her magic was revealed to both Ray and the audience after he opened up to her about his previous disco group in a clever callback to last season’s offscreen adventure, and it turned out she was a shapeshifter. Of course, once Charlie’s name was mentioned it became clear that she would eventually turn into Maisie Richardson-Sellers, so her being a shapeshifter wasn’t much of a surprise. Nevertheless, it was a winding path to get her there. 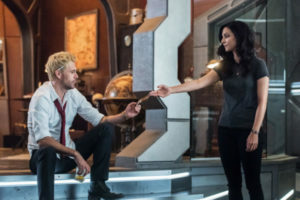 Ray’s bond with her was immediate and very sweet to witness, and certainly reminiscent of his reaching out to Nora last year, but the rest of the team’s reactions were less touching. Even Zari (Tala Ashe) was prepared to send Charlie to Hell before she even did anything, which seemed like a leap based on her previous characterization. In the episode, Ray explained it as the team losing their moral compass when Amaya left the ship, but it still felt a little like “Dancing Queen” was bending personalities in order to fit the plot. Whether the individual members are religious or not, Hell is a very real place in the world of this show, and it’s not exactly there to house someone who so far has stolen a corgi and at worst impersonates the Queen in a wild night of partying. As if he could read my mind, Ray stood his ground and made the case for Charlie’s humanity in the face of his friends repeatedly calling her “the creature.” And after stealing his Atom suit for a showdown, Charlie resorted to shapeshifting into each of them as a desperate plea to save her own skin. Her final transformation was into Amaya, which seemed to do the trick even if the price was John stealing her powers and trapping her in that form as punishment. Once Nate admitted that he also freed Nora from the Time Bureau because that’s how much he believes in second chances, it was settled that Charlie would stay with the team for now. It’s a convoluted way to return Richardson-Sellers to the fold, but I can overlook it in my excitement to have her back. Zari makes friends wherever she goes. prolonged his stay once more and thus postponed an encounter with the woman who now looks like his lost love. Another thing that matters? Gary quoting everyone’s favorite CW promo with his “dare to defy” motto, which was perfect for Taco Mondays. Legends of Tomorrow airs Mondays at 9/8c on the CW.